Data(contentsOf: URL) will attempt to download the data from the URL we provided, as this run on main thread, the main thread is occupied (blocked) with this download task and can't handle our UI interaction hence we feel that the app 'freezes'. 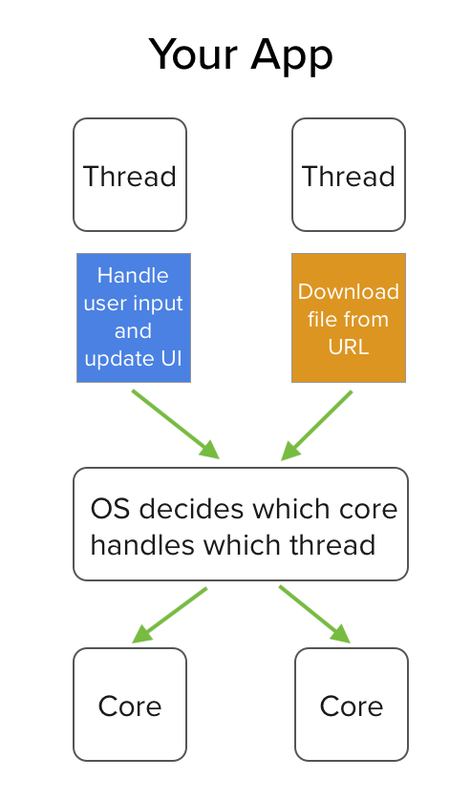 To understand the phrase "main thread is blocked", we first need to understand the concept of thread and concurrency. Long time ago, most personal computers have only one CPU core and they can only do one thing/task at a time (ignoring hyperthreading and virtual cores). When you do multiple task on a single-core computer, the CPU splits it time between all these task with very very short interval, giving us mere mortal an illusion that it is running multiple task at once. 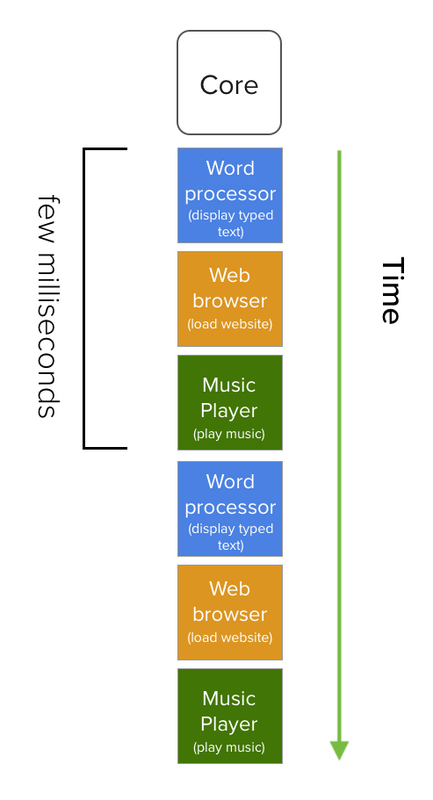 For a multi-core computer, it can actually perform multiple task at the same time on different core, thus increasing performance. 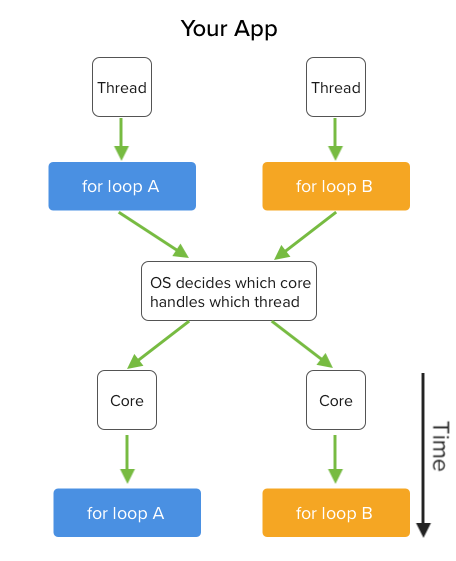 The concept of multi-core can be further extended into multi-threading in an application. 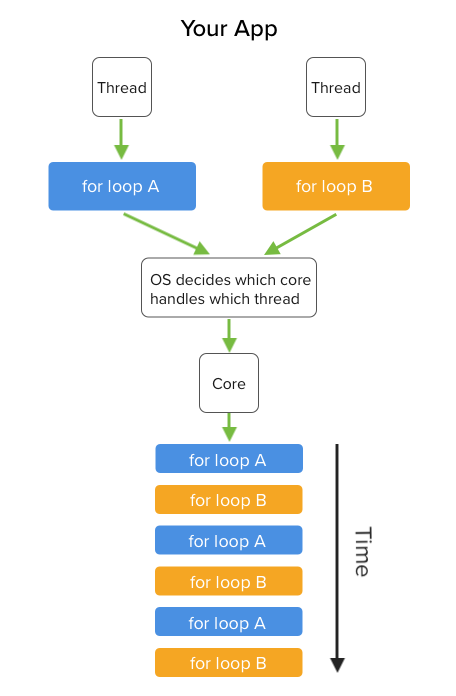 Typically we don't explicitly tell which core of a computer to perform a certain task, usually we group a sequence of task (multiple lines of code/ a function etc) into a thread, and then the Operating System (eg: iOS) will decide which core handles which thread, and pass the thread (with task inside) to the core to execute. 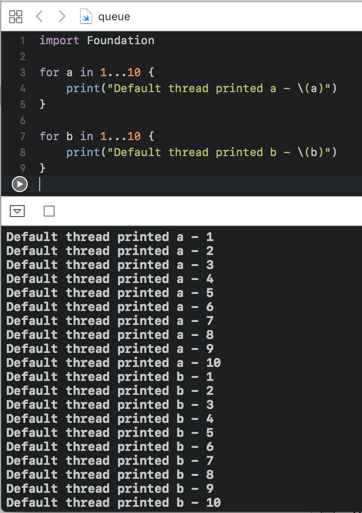 Code in the same thread is executed sequentially, meaning from top to bottom, the second loop will only be executed after the first loop has finished. The two loops are running at the same time! 😳 This is because the two threads are ran concurrently. The core will switch between the two for-loops with a very quick interval (milliseconds) , causing an illusion that both for loops are executed on the same time. Chances are, in a multi-core computer, one of the core might keep switching between different thread/task (actually all of the cores might keep switching between different threads). Apple recommends us to migrate away from dealing with thread directly and use their queue (Dispatch queue / Operation queue) instead. Instead of creating a thread to handle task concurrently and managing them, Apple recommends us to put task in a queue and let the operating system to handle the threading stuff like creating threads, placing task into thread, thread communications, etc. Remember the default thread we mentioned earlier? 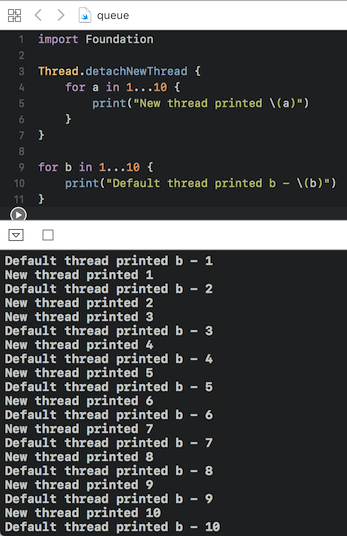 If we didn't explicitly define a new thread, the code will be executed on the default thread. 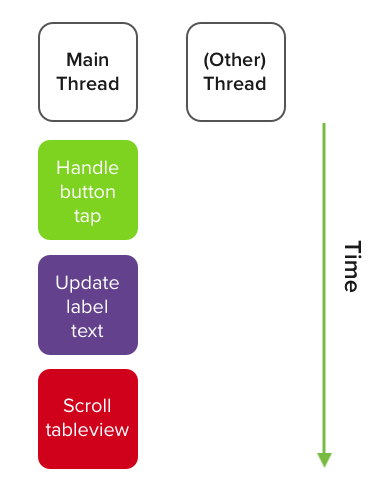 In iOS, the default thread is also called as Main thread or UI thread, this is because the user interface (UIKit) of the app runs on the default thread as well, this includes handling button tap, updating label values, scrolling table views, etc.. The UI is still responsive to our input because the two for loops we added take very tiny amount of time (milliseconds) to run on the main thread. 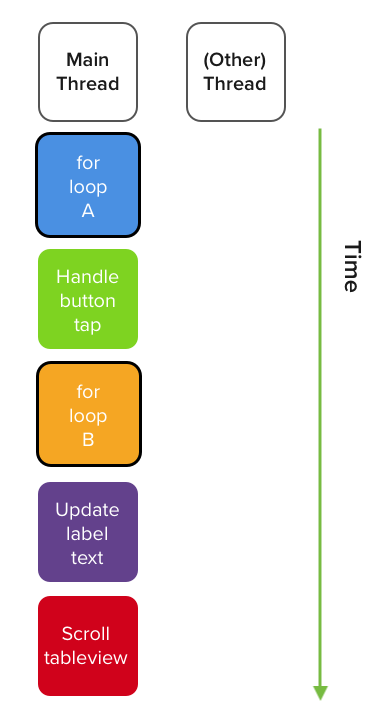 After the loops have finished running, the main thread can respond back to user input. 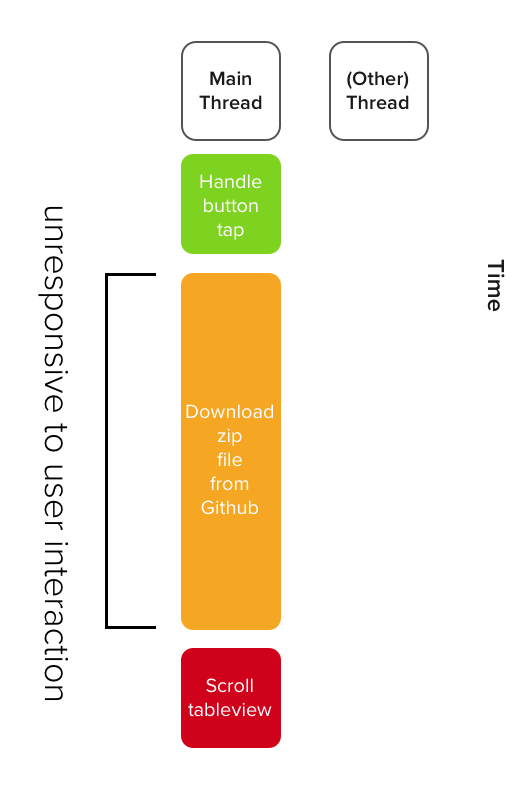 As you might have guessed, if we run a non-UI task that takes a long time on the main thread, it will cause the UI to be unresponsive as the main thread needs to finish processing the task before it can go back to handling UI (eg: user input such as tap, and also updating the display/graphic on screen). For DispatchQueue, other than creating our own serial / concurrent queue, we can also access the Main Queue and Global Queue using DispatchQueue.main() and DispatchQueue.global() . The code placed inside main queue will be passed to the main / UI thread, whereas the code placed inside global queue will be passed to different background threads depending on their priority. There's multiple background threads but only one main thread. 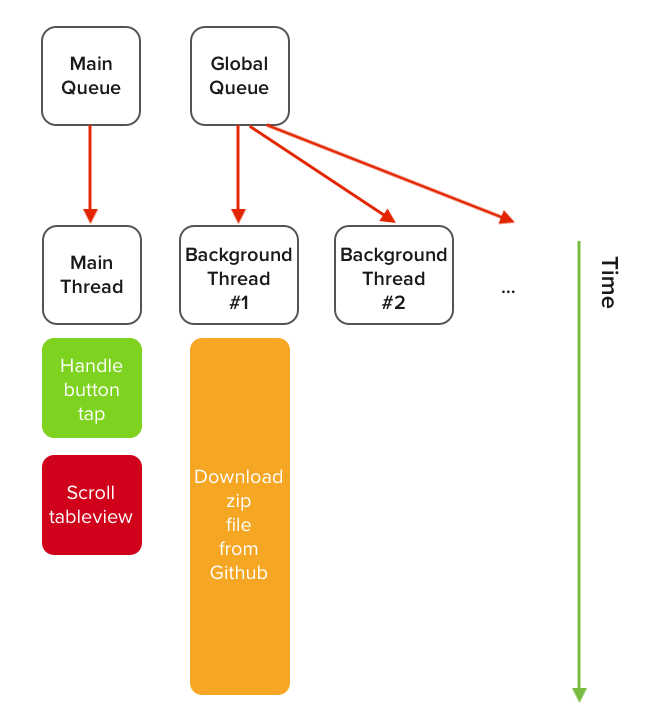 One thing to note is that main queue is a serial queue, where task will execute following order from top to bottom, whereas global queue is a concurrent queue where multiple tasks might be dispatched to different threads at the same time. self.nameLabel.text = "Zip file downloaded"
Apple's official documentation mentioned that updating UI on a thread other than the main thread can result in missed UI updates, visual defects, data corruptions, and crashes. One of the key to making performant app is to move as much non-UI related heavy processing to background thread as possible so that user won't experience lag / freeze on the UI.